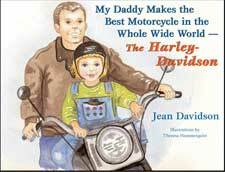 In this Illustrated hardcover book for children Jean Davidson and her son, Jon Davidson Oeflein, explain the history of motorcycles. The story begins with the invention of the wheel and tracks each development along the way. Those building blocks were there for Jean’s Grandfather, his brothers and a friend to put together a uniquely American product, the Harley-Davidson motorcycle. Written and illustrated to make history clear for young readers, this book also makes an important point for developing minds–All of these advances were built on the work of inventive individuals who came before. 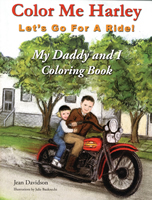 This book is for the youngest and newest generation of motorcycle lovers. They are the children who delight in hearing, seeing, and having rides on motorcycles. 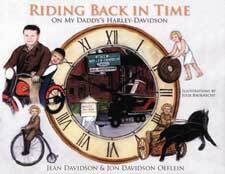 This hardcover durable timeless treasure for children is the story of how Harley-Davidson came to be. The story is told through the eyes of an eight year old who goes everywhere with her daddy. Her daddy being Gordon Davidson, the son of founder Walter Davidson who was the fi rst president of the Harley-Davidson Motor Company. Color Jeannie and her Daddy with her animal friends doing all the fun things you can do with motorcycles. 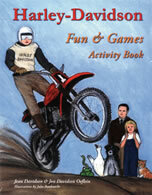 This book is a fun activity book for young motorcycle enthusiast who will learn about motorcycles while haveing fun doing the games and activities in this 24 page book. There are mazes, puzzles and other creative activities all based on the Harley-Davidson motorcycle.